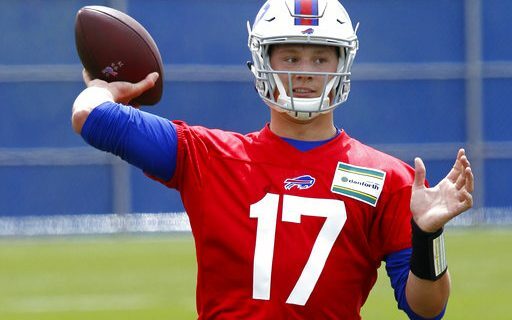 Gabriel: Can Josh Allen Become a Winning QB? Yes, I know I have been the person who has said for the last eight months that if Josh Allen is drafted in the top 10 he has a better chance of busting than having success. Based on the numbers that Allen put up at Wyoming the last two years and the numbers put up by quarterbacks drafted since 2005, my feelings have validity. The fact remains that no first round quarterback drafted in that time with as low a completion percentage as Allen’s has had success in the NFL. Now, if you’re a Bills fan comes the good news. There can always be an exception! That exception has a lot to do with two things…the coaching Allen gets and how Allen accepts that coaching. In the NFL the difference between a player having success and failing can often depend on his football character. What is football character? It’s a number of things that includes a player’s drive to become a great player, his work ethic, his intelligence as it pertains to his position, his love and passion for the game, his ability to accept coaching and leadership. From all the research I have done, Allen has all those traits. So now it’s a matter of him working hard to improve upon his weaknesses. If we go back to past 2005, we will find quarterbacks who had accuracy concerns and still developed into winning NFL quarterbacks. The first person who comes to mind is Michael Vick. Vick, drafted in 2001, had a career completion percentage of 56%, the same as Allen’s. In Vick’s final year at Virginia Tech he completed just 54% of his throws and still became the first player taken in the ‘01 Draft. Now I’m not comparing Allen to Vick as they have entirely different skill sets but some of the numbers are similar. Yes, we are going way back on this one, but Jim Kelly only completed 55.6% pf his throws as a college player. In Jim’s final season, he was at 63% but he only threw 81 passes before he injured his shoulder. The previous year he was at 58.9%. The last one I will bring up is Brett Favre. Favre never completed better than 55.8% of his throws in a college season and that was his sophomore year. His final two years at Southern Miss he was at 54.2%. No one can tell us that Jim Kelly or Brett Favre weren’t accurate NFL passers. Accuracy is not just about completion percentage, it is also about ball placement. In the NFL, a QB has to put the ball in the right spot as the window to complete a throw is much smaller than it is in college. In short, the QB has to put the ball where the defender isn’t. Often times in the NFL the difference between a completion and an interception in the NFL is inches…that’s how accurate an NFL quarterback has to be. Going back and looking at many of Allen’s throws, on the throws where his accuracy is way off it’s usually because of his footwork. Josh has a good throwing motion and there hasn’t been a quarterback in the last few years that has his kind of arm talent. So basically it’s going to be all about mechanics with him. We have seen him make every throw necessary to be a top NFL passer, he just doesn’t do it with consistency. To get to that consistent level is up to Josh and his coaches. The coaches have to know what the mechanical problems are and correct them and Josh has to work countless hours on refining his mechanics so that it becomes second nature. Using Jared Goff as an example, as a rookie Goff did not have the people around him to help him improve on his flaws. After a coaching staff change was made following his rookie year Goff was surrounded with some of the best quarterback tutors in the game and we saw the improvement. Goff went form a 54% passer to a 62% completion rate and his touchdown to interception rate went from 5 TD’s, 7 interceptions to 28 TD’s and 7 interceptions. Bills fans just have to hope that the Bills staff can do the same for Allen. This isn’t something that can or will happen overnight. It will be a work in progress. As I have stated a few times, the best thing for Josh Allen is not having to play this year. If that happens, who knows how good he can become? Paul Peck on how the Bills need to stick to the Josh Allen plan.